Enjoy the beautiful desert terrain with a vacation getaway to Arizona. From the Grand Canyon to the bustling city life of Phoenix and Flagstaff, Arizona blends together perfect combinations of natural beauty and exciting activities. Whatever you are looking for to complete your dream vacation, this gorgeous state has it. The Grand Canyon Vacation is a fantastic way to explore the Grand Canyon area and learn about the history there. With the Grand Canyon Airplane Tour Package, you will enjoy 3 Nights' accommodations for an unforgettable scenic vacation, as well as the Grand Canyon Landmarks Tour by Airplane and the Grand Canyon IMAX Movie: IMAX and Meal activity. 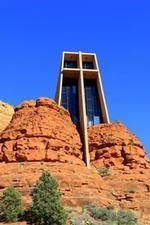 Visit the beautiful terrain of Sedona, Arizona. 2 Nights’ Lodging in your choice of over 26 hotels. Take a family excursion across Sedona’s sandy desert landscape with the Sedona Vacation Getaway, including two nights’ of welcoming accommodations as well as the Discover Sedona Small-Group Tour.